Description: NASA's DC-8 Airborne Science platform shown against a background of a dark blue sky on February 20, 1998. The aircraft is shown from the right rear, slightly above its plane, with the right wing in the foreground and the left wing and horizontal tail in the background. The former airliner is a "dash-72" model and has a range of 5,400 miles. The craft can stay airborne for 12 hours and has an operational speed range between 300 and 500 knots. The research flights are made at between 500 and 41,000 feet. The aircraft can carry up to 30,000 lbs of research/science payload equipment installed in 15 mission-definable spaces. 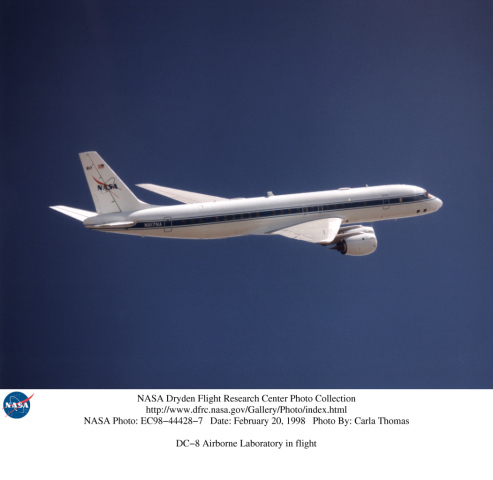 Description: NASA used a DC-8 aircraft as a flying science laboratory. The platform aircraft, was based at NASA's Dryden Flight Research Center, Edwards, Calif., collected data for many experiments in support of scientific projects serving the world scientific community. Included in this community were NASA, federal, state, academic and foreign investigators. Data gathered by the DC-8 at flight altitude and by remote sensing has been used for scientific studies in archeology, ecology, geography, hydrology, meteorology, oceanography, volcanology, atmospheric chemistry, soil science and biology.